I have fond memories of Slovak Ginger Cookies. My dad’s aunt made them every Christmas and I remember sitting in her kitchen, on a large bench by the kitchen table, eating crispy cookies with tea. Many years passed, I forgot about them and then one day, 4 years ago I remembered pale crisp cookies with a characteristic taste. I called my mom to refresh my memory. Moms seem to remember everything. We call them “Zazvorniky”. Zazvor means ginger. Ginger cookies. Don’t be surprised by the amount of ginger used in these cookies. Some people add even more. These cookies are very much regional, you don’t see them a lot. Special “ginger cookie”cookie cutters are used to make these, since I don’t have any of them I use other shapes like stars, rounds, snowflakes, flowers etc. Using a wire attachment beat together eggs and sugar for 10 minutes until doubled in volume and pale in color. Add cooled melted butter and beat for a few minutes until well combined. Remove wire attachment and using paddle attachment on low speed add flour in 2 additions, mix until dough comes together. It you feel it is too dry, add 1tsp milk. 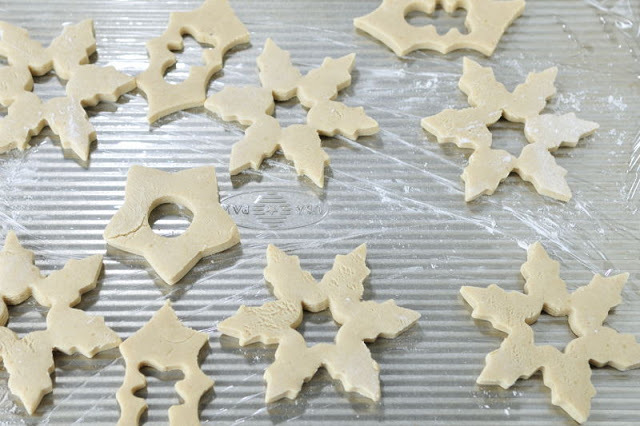 Roll the dough between 2 pieces of parchment paper into about 1/4 inch thick and cut out shapes, using a small cutter cut out the center as well. I used tree cutters, snowflake with a round center cut out and a star with round center as well. 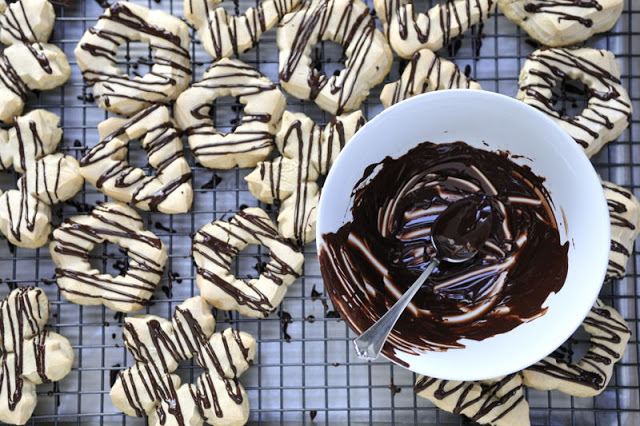 Transfer cookies, invert each cookie upside down onto a baking sheet lined with a plastic wrap. Let dry overnight, uncovered. Preheat oven to 350F. Using a spatula transfer cookies from the plastic wrap onto a baking sheet lined with parchment paper. Try not to crowd the baking sheet. Bake cookies for 10-12 minutes, until edges are well risen and very very light in color (they shouldn’t be brown). Once you open the oven there will be a slight smell from the baking ammonia, this is normal. Cookies won’t smell of ammonia. Remove baking sheet from the oven and let the cookie to cool to room temperature. Store cookies in the airtight container or a paper box. These cookies are light and crisp. Notice cookies are drying on a piece of plastic wrap, upside down. I just pulled out our first batch of these and they are wonderful and light. Is there a truck to making them more uniform? I'm making them for a fundraiser.